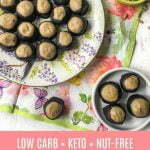 If you love peanut butter buckeye candy but want a low carb, keto version? 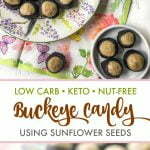 Try this low carb buckeye candy recipe that uses sunflower seeds! Easy and delicious, one piece has only 1.5g net carbs! You might also like keto toasted coconut freezer candy. 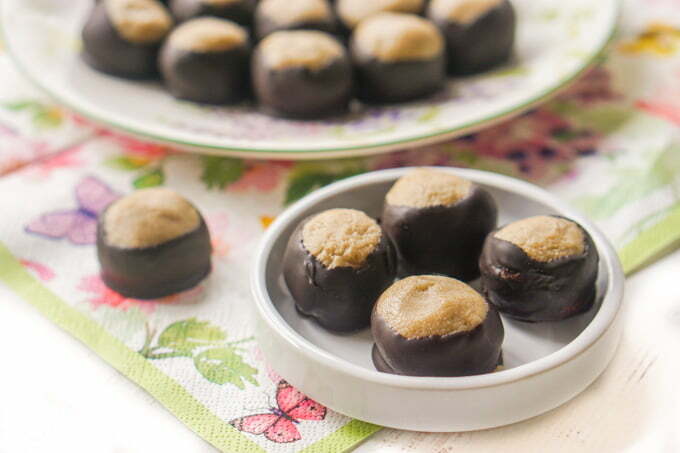 I don’t know about you but I love buckeye candy. Honestly it’s just really a Reeses cup in different form. However, I can not tolerate too much peanut butter. It just gives me a headache so I try to limit it. 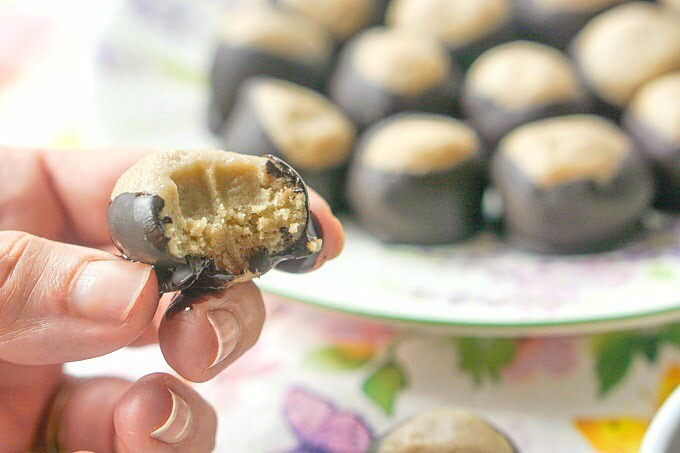 That’s why today I made this low carb buckeye recipe using sunflower seeds instead! I love sunflower seed butter. It’s a great substitute for nut betters and so easy to make. 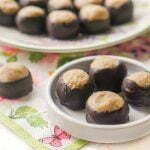 I keep these buckeyes in the freezer and just have 1 after dinner. They are really filling. Just about everyone loves peanut butter but not everyone can eat it because of allergies. Peanut butter is high in protein and often thought to be a good protein snack. However many commercial peanut butters have added sugar and additives. Sunflower seed butter tastes similar to peanut butter and is safe for those with peanut allergies. It too is high in protein as well as magnesium and vitamin E. To learn more about the benefits of sunflower seed butter check out this Dr. Axe article. 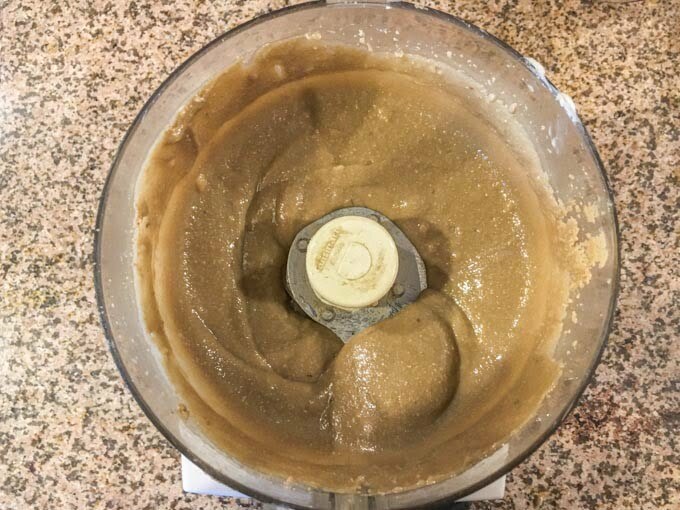 Making sunflower seed butter is super easy to make at home. Below I bought a package of roasted sunflower seeds from Aldi and just processed them until they looked like the picture below. Then I added in the butter and you can how it looks even smoother and creamier. You can eat it as a spread without the butter, however for this recipe you need the butter and additional Swerve sweetener. Start by adding your sunflower seeds to a food processor and pulse until because a butter like peanut butter. Add in the butter and process some more until it’s smooth and creamy. Lastly add in the Swerve sweetener and it should form a dough. 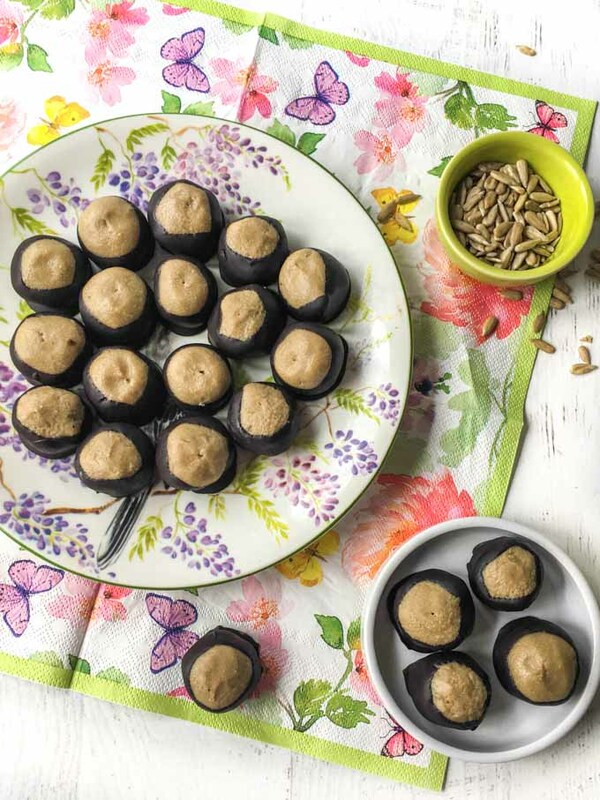 Roll the dough into small balls and place on a parchment lined cookie sheet. Freeze for 1 hour. Take the Moser chocolate bars and place into a very small ramekin. Melt in the microwave for 30 – 60 seconds or until melted completely. Mix well. Take a tooth pick and spear one of the balls and roll it around in the chocolate. Place back on the covered cookie sheet. Continue with all of them and then refrigerate until the chocolate has dried. I like to story these in the freezer so they last longer. I bought everything (except the Swerve sweetener) at Aldi. You can buy raw or roasted sunflower seed kernels. I bought the roasted but if you buy raw, just toast them first in a dry skillet to add more flavor. 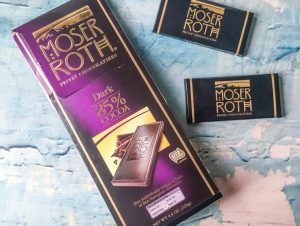 The chocolate I used was Moser Roth 85% cacao bars. They only have 6 net carbs in each little bar. You can use other low carb chocolate if you want. 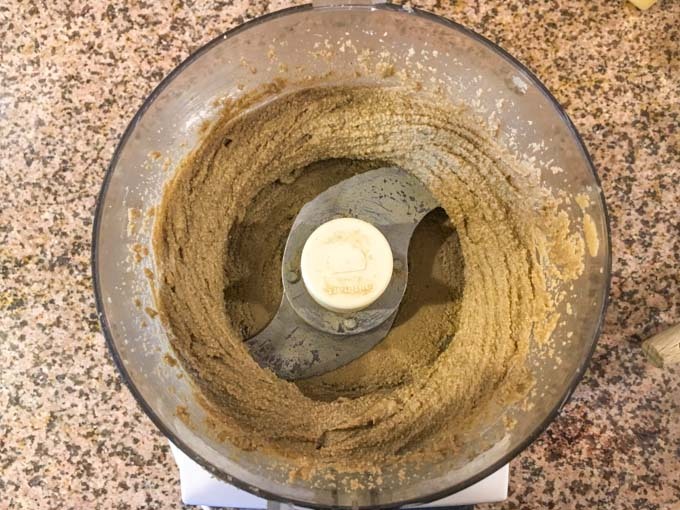 Add the package of sunflower seeds to a food processor and grind until it starts to turn into a butter. Add in the butter and pulse until the whole mixture is creamy and fluid. Pour in the Swerve sweetener and pulse until makes a dough. Take out and form into balls, place on a parchment lined cookie sheet and freeze for 1 hour. Take out of freezer. Break up 2 candy bars and place in a SMALL microwavable dish. You want a small ramekin or something that you can roll the balls around in but not waste too much chocolate. Microwave for 30 - 60 seconds. Mix well and set aside. Take a toothpick and gently stick into one of the balls. Roll it around the chocolate and place it back on the parchment lined cookie sheet. Continue with the rest. Let them dry and then refrigerate or freeze. I keep mine in the freezer and they work great. Yum, those look so good. What a great way to use seed butter for a sweet treat. I can’t wait to try the recipe. I cant wait to try this delicious, soft, chewy and healthy recipe. Can try it for Easter. Oh Boy!! I’d love to have several of those right now. Just got down with a long power walk and I’m looking for a snack. I can’t believe they are low carb and keto friendly. Next gathering we’re having I’m making them for the kiddos, and me of course. I think this looks like a great treat for all the company that is coming this weekend, With all the holiday eating, having something healthy is a good thing. I will make lots so that I can have some for myself. I will need some energy after all the cooking is said and done. 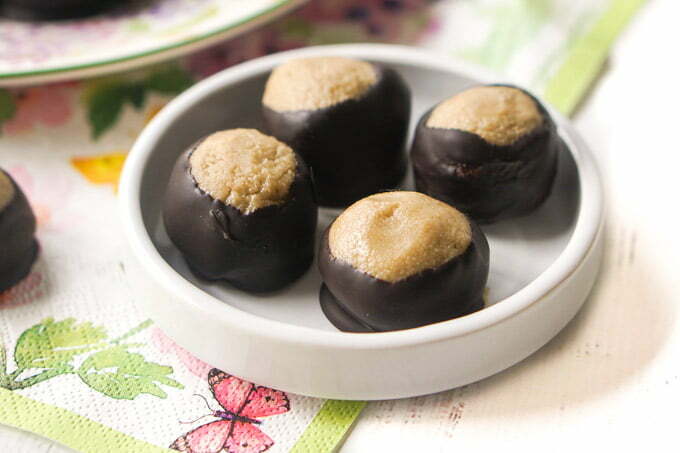 Yummm I love buckeyes! I can eat lots of them (which is prolly not a good thing lol). Thanks for coming up with a healthier option. I can’t wait to try with sunflower seeds. Oh wow! Those would be great right about now. Love the fact that they’re a healthier alternative to two of my favorite flavors!